Dracula, Bram Stoker and Whitby. Whitby was the inspiration for Bram Stokers Dracula novel. Whitby is proud of its Dracula connection and of Bram Stoker's stay. 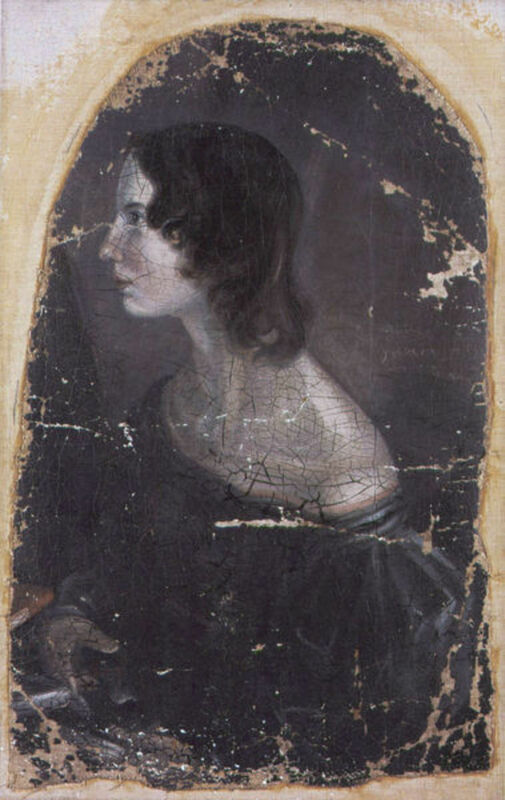 We know the Gothic horror novel Dracula Bram conceived at Whitby. Its craggy clifftop complete with graveyard at the edge and the ruined abbey just ooze Gothic Romance from every stone. 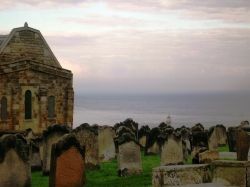 Whitby boasts its own Goth Festival and people come from miles around to celebrate Dracula's famous author Bram Stoker. Whitby is dominated by the cliff-top ruins of 13th century Whitby Abbey, which is quite a sight to behold and figures also in Bram Stoker's Dracula. What is your Whitby Dracula experience? 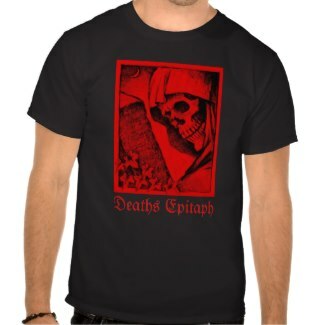 Intro image by Oliver Tadpole - Deaths Epitaph - used with permission. Please do not copy! All other photos are by me, some featured in Persimew on Zazzle. "The houses of the old town...are all red-roofed, and seemed piled up one over the other..." So wrote Bram Stoker in his famous novel Dracula. How the novel Dracula was born at Whitby. Bram Stoker was the third of seven children born in Fairview, Ireland in 1847. Although illness kept him bedridden until he was seven, he recovered enough academically to go to Trinity College in Dublin. He graduated with Honours in mathematics in 1870 and competed in athletics, so his recovery was good. He took up a career in writing, where he was a moderately successful "jobbing" writer of non-fiction books and theatrical reviews. He met the great actor Henry Irving after giving him a favourable review as Hamlet. The two dined together and became good friends. As a result he became theatre manager for Irving's Lyceum Theatre in London and held this job for 27 years. He also knew Oscar Wilde and met and married Florence Balcombe, Wilde's former girlfriend, in 1878 before moving to London. The couple had one child in 1879. Stoker met many influential people in London, including Sir Arthur Conan Doyle, William Yeats and Oscar Wilde. 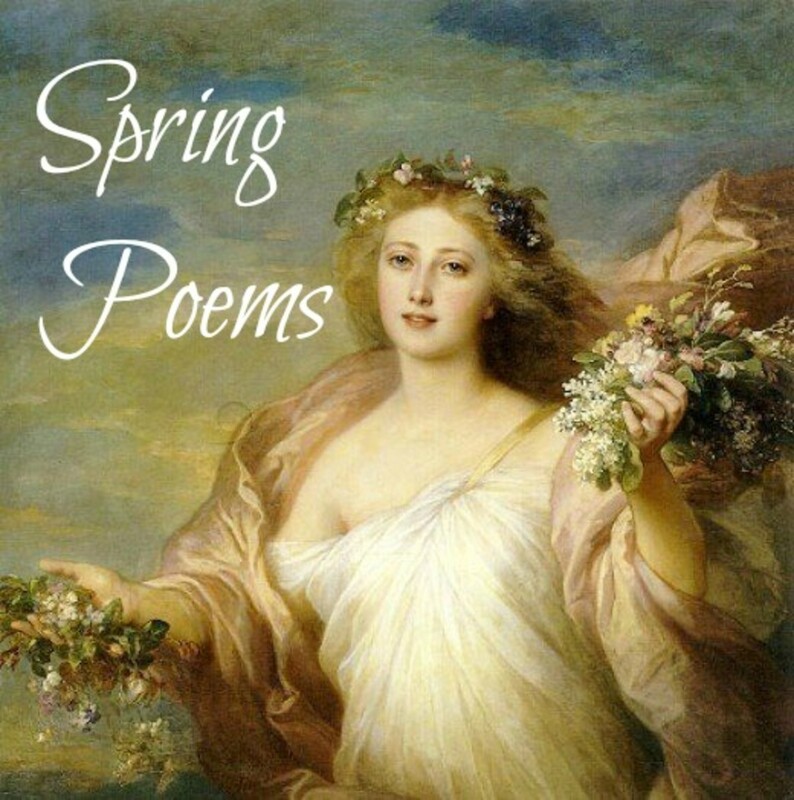 Stoker's work with Henry Irving enabled him to travel the world, including Eastern Europe, and he would have absorbed the tales and atmosphere en route. Whitby however was the inspiration for Dracula. Its dangerous coastline the perfect setting for the shipwreck that brings Dracula ashore as a great Black Dog. Staying at the Royal Hotel would give him a view of the whole of the dramatic harbour, the East Cliff, the Abbey, the winding cobbled streets and the brooding silhouette of the church, St Mary's, with its graveyard at the cliff edge. The 199 steps up to Caedmon's Trod make a bracing walk and give a haunting view when the mist is in the harbour. Bram Stoker suffered a number of strokes which may have led to his death in 1912. His ashes were held in the Golders Green Crematorium in London. His wife survived him by 25 years and despite bringing legal action against the maker of the film noir, Nosferatu, the Stoker family did not experience the huge success that Dracula later became. The infamous Count arrived on a ship washed ashore in the harbour and Lucy watched from the churchyard as the sun set over Kettleness but could not remember how many steps she climbed. Stoker's story incorporated various pieces of Whitby folklore. Following the Baron on the Dracula Walk fills in the pieces of how Bram Stoker wrote his classic novel. 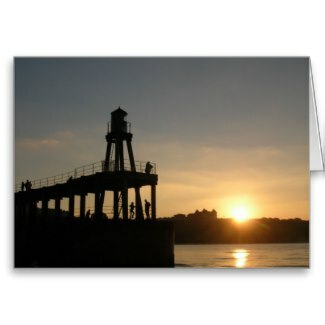 Greeting cards featuring Whitby harbour at sunset, blank for your own message or greeting. 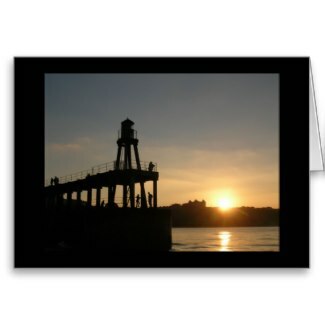 Ideal for Whitby businesses, discounted for bulk purchases and also available from Zazzle UK! Combines Tennyson's Poem Crossing the Bar with an atmospheric photo of Whitby Harbour taken from the sea. You can customize this atmospheric photo of Whitby Harbour at Sunset taken through the rigging of a sailing ship. "Whitby figures quite centrally in a significant section of the novel Dracula (Chapters 6-8). 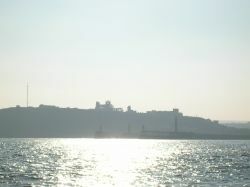 It is where the Russian ship "Demeter" comes ashore and is the location of the first encounters between Dracula and Lucy. Today, there are many points of interest for the Dracula enthusiast in Whitby." Bram Stoker's Dracula and the Blue Plaque - Or Dracula (Stoker) slept here? There are two hotels in Whitby where Bram Stoker is said to have lived while he was writing Dracula. The blue plaque illustrated in many sites is actually wrongly placed as he only stayed in that hotel (a small private house) for a couple of weeks. Book Whitby hotels at Room4U and save 30% or more on late deals. Online Whitby Accommodation searches SAVING YOU TIME, SAVING YOU MONEY!! This map will help you find your way to and around Whitby. Make your Dracula experience more fun with a Whitby map! 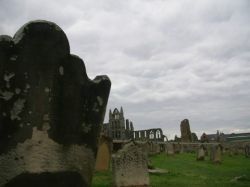 Whitby hosts a biennial Gothic Weekend, which is a festival for members of the Goth subculture. Guest arrive at hotels with floodlit hearses and coffins! Apparently the Cheeky Girls regularly attend to keep in touch with their Transylvanian roots. I personally don't know how many of the names in Dracula are on Whitby gravestones, my guess is quite a few. It might be fun to go looking next at the names on the stones near the cliff edge! We sat and ate fish and chips on the Bram Stoker Memorial seat. It was the view from this spot that inspired Stoker's Whitby scenes. You can see the harbour, the ruined Abbey, the Church, and the stone steps and just to the left is the cliff where the "Demeter" came ashore, a dead seaman lashed to its wheel. "The view from this spot inspired Bram Stoker (1847-1912) to use Whitby as the setting of part of his world-famous novel DRACULA. This seat was erected by Scarborough Borough Council and the Dracula Society to mark the 68th Anniversary of Stoker's death - April 20th 1980". Whitby hotels, guesthouses and bed and breakfasts lodging and accommodation. Hotels and b&b accommodation in Whitby. 37, Cliff Street is a family owned self-catering holiday cottage situated in the North Yorkshire coastal town of Whitby. whitby Cottages. whitby Holiday Cottages. whitby in North Yorkshire has a great selection of quality self-catering cottages. Please browse our selection of whitby Cottages. A spine-chilling show. The ultimate Dracula Experience! 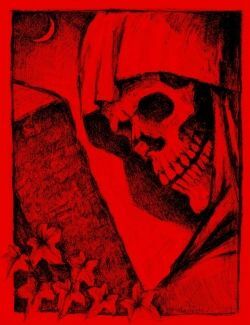 A guide to the real Dracula story & his connection to Whitby, Yorkshire's unique vampire town. Hotels, B&B, Goth Weekend & more! Reports on smoke machines used at the Dracula Experience in Whitby. Description of the machines in use and how effective they are. I keep meaning to find time to re read Dracula. I go to Whitby quite often too. Some great images on here. Very Kewl lens! I had to bookmark to come back again to finished reading the other end of the links. I was not real familiar with Whitby so this has been fascinating. What a fascinating topic for this lens - the inspirational setting for Bram Stoker's Dracula. Wonderful and blessed!